Bass Fishing – Dawn and dusk are definitely when the biggest bass can be brought in. First,remember that they love to lay in ambush spots which offer them lots of cover from their target bait fish. They like to hid, and pounce on their prey. These bait fish are most active in the early morning or evening. 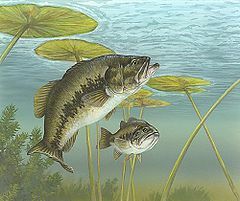 When they feed, bass follow because the baitfish are less aware of threats when they feed. Go out bass fishing during these times for the best success – additionally you will have the water to yourself as most anglers don’t fish during these times. Thanks for the Bass fishing tip Brian. I hope you all find it helpful. It is tips like these that help us when we go out fishing, if you found this tip helpful why not leave a comment telling us how you got on with it.